Honor or memorialize a beloved pet or a special person in your life with a donation in their name to help the cats we rescue and to make future rescues possible. Thank you to our wonderful supporters who have made donations to honor a special someone, human or furry, in their lives. ​Sparkle Cat Rescue is volunteer run with ZERO paid employees, and 100% of your donation goes directly to purchase the supplies, medications and veterinary care needed to care for the homeless cats and kittens in our care. Please indicate if the donation is in honor or in memory. After sending in a donation, please email us at sparklecatrescue@gmail.com and provide us the name(s) of the person(s) and/or animal(s) for which the donation is made. If you would like an acknowledgement card sent, please include: Name of person/family to be acknowledged, along with street address and email (if known) Your name (or from whom the donation is coming), along with street address, email, daytime phone number (optional). 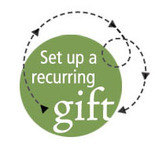 We can also process honor & memorial credit card donations via telephone. Please email us at sparklecatrescue@gmail.com and we will contact you by phone immediately. We accept Master Card / Visa / Discover / American Express. ​Make a secure, tax-deductible online donation through Paypal by clicking the “Donate” button below: (you can use your PayPal account or donate as a guest). ​Please note: The address above is a locked mailbox only. We do not have a facility. All cats are in foster homes throughout the Triad of North Carolina. We are 100% volunteer and do not have an office at this time. Don't forget: If you have made an online PayPal donation or sent us a check and have not notified us who your donation is in honor or in memory of, please email sparklecatrescue@gmail.com with the information. ​Please include a photo if you wish. 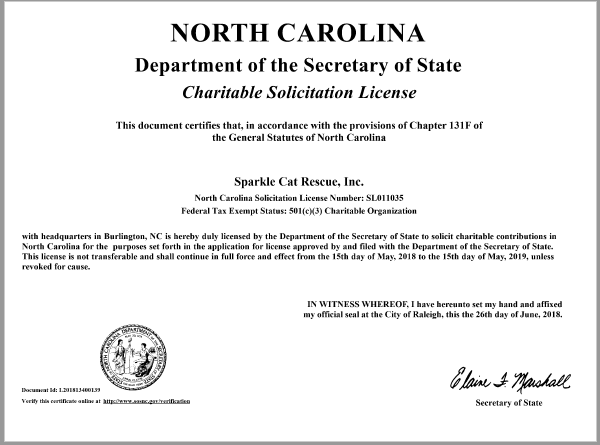 Below are examples of a Gift Donation Certificates that can be emailed to the person you are honoring with a gift of a monetary donation to Sparkle Cat Rescue. We can send this certificate to your email address so you may print it, or we can email it directly to the person you are honoring and blind copy you in the email.